Scotland has five major canals: the Caledonian Canal in the , the Crinan Canal in the heart of and the Forth & Clyde Canal and Monkland Canal in the central belt. The network is completed by the Union Canal. 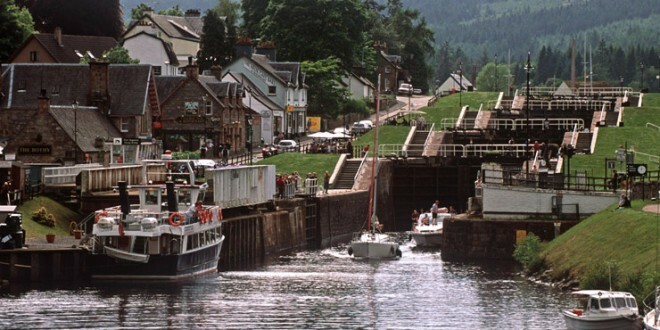 The Caledonian Canal is truly the ‘international gateway’ to cruising in Scotland. Stretching from Inverness to Fort William, it is one of the great waterways of the world, offering visitors – afloat and ashore – spectacular scenery and amazing wildlife to enjoy. The majority of traffic is leisure orientated. The gateway for visiting yachts from continental Europe, holidaymakers can charter a yacht or power cruiser and enjoy a holiday ‘in command’. Hotel barges offer either activity holidays, or a more relaxed cruise. The Caledonian offers excellent marina services for both the visitor and those seeking a cost-effective long term berthing solution. Dubbed ‘Britain’s most beautiful shortcut’, the Crinan Canal provides an alternative to voyaging around the Mull of Kintyre. It runs from Ardrishaig on Loch Fyne across 9 miles of the picturesque Kintyre peninsula before emerging at Crinan onto the Sound of Jura with the Western Isles beyond. Crinan is a superb still-water marina base from which to cruise, race or charter high quality yachts. Licences are available from overnight to an annual package, which can include lift out during the winter months. Once a vital commercial route, most traffic on the canal today is there for pleasure rather than business. As well as the truly magnificent Argyll scenery to enjoy, the canal passes through an area rich in and with miles of forest and pathways to explore. Fully refurbished in 2002, the historic Forth & Clyde Canal provides 35 miles of fully navigable waterway which crosses central Scotland from East to West (from the Forth estuary at the River Carron to the Bowling Basin on the River Clyde). It provides coast-to-coast navigation for those wishing to explore Scotland by sea, while creating a circular network of canals. The canal passes by large vibrant towns, busy thoroughfares and into peaceful country locations with many interesting places to visit along the way. The highlight is undoubtedly , the world’s only rotating boat lift that connects the Forth & Clyde with the Union Canal. Located less than an hour’s drive from Glasgow, Bowling Marina has proved extremely popular as a cost-effective base for yachts and motor cruisers in both summer and winter. For wintering ashore in particular, potential customers are strongly advised to book early as all spaces have sold out in recent seasons. Shore power units have been installed, and 24-hour security is provided. Customers holding long-term licenses – 3 months and over – may also visit other Scottish canals at no extra charge. Visitors to the Falkirk Wheel will also be able to enjoy . This new outdoor recreational area is filled with woodland and parks, a watersports lagoon, pathways, cycleways and the spectacular 30-metre-high landmark sculptures of the mythical water spirits, The Kelpies. The Union Canal runs for a little over 30 miles from central Edinburgh to the amazing Falkirk Wheel where it links with the Forth & Clyde. Famous landmarks on the canal include the Avon, Almond and Slateford Aqueducts which are amongst the finest in Britain. Boat hire is available to allow you to explore the canal at your own pace or you can join a cruise and even dine in a restaurant boat while someone else steers! A relatively short stretch of water just over 12 miles in length, the Monkland Canal was built to link the coal mines in Monklands to nearby Glasgow. Nowadays, there is a great deal to explore along the waterway, for instance a visit Summerlee Museum of Scottish Industrial Life, based around 19th Century ironworks. Ride on an electric tramway, visit miners’ cottages and take a guided tour of the recreated mine while you’re there. Explore the North Calder Heritage Trail along the canal from Summerlee which is carpeted in wildflowers, a prime spot to watch for birdlife like moorhens and herons. Beside the canal lies Drumpellier Country Park where you can enjoy boating on one of its lochs or enjoy a peaceful woodland walk. Discover idyllic rural luxury on a . Nestled in serene and spectacular surroundings on the banks of the Caledonian and Crinan Canals, a stay at one of Scottish Canals’ newly renovated historic cottages offers the very best of luxury, spectacular scenery and wildlife on your doorstep. Find out more information about .